Uptown series to create Cleveland’s live music neighborhood. Follow #UptownRoots for updates. CLEVELAND – The Cleveland Foundation today announced a $50,000 grant to support Cleveland Foundation Uptown Saturday Nights, a collaboration between University Circle, Inc., Case Western Reserve University and Roots of American Music (ROAM) to host a free live music series that will activate the Uptown District in University Circle on Saturday nights from 7 p.m. – midnight throughout late summer and fall 2016. 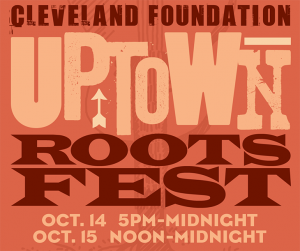 Beginning Saturday, Aug. 27, and culminating with the Cleveland Foundation Uptown RootsFest on October 14 – 15, the series will celebrate the roots of American music – blues, jazz, gospel, hip hop, traditional country, folk, Americana, bluegrass and zydeco, among others – as performed by local musicians across multiple Uptown District venues within walking distance of one another. 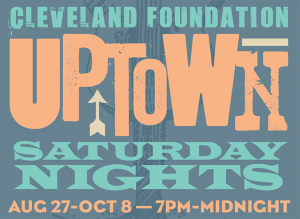 Cleveland Foundation Uptown Saturday Nights and RootsFest are free and open to the public, and include support from Uptown property owners and No Depression – the premiere magazine and online journal focused on roots music in the U.S. The Blues Accordin’ to Lightnin’ Hopkins, 7:30 p.m.
A Well Spent Life, 8 p.m.
Festival Stage on Toby’s Plaza – performer: New Soft Shoe, 6 p.m.
High Plains Jamboree, 9:30 p.m.
Heights Music Shop, 12:30 p.m.
SpYder Stomper and Sugar Pie, 3:30 p.m.
Sam Hooper Group, 1 p.m.
Charlie & Celia, 2:30 p.m.
Rebekah Jean + Duchess, 4 p.m.
Shakka Hasberry + JR Blessington, 5:30 p.m.
Zoe & Cloyd, 9:30 p.m. The series will culminate in Cleveland Foundation Uptown RootsFest on Friday, October 14 and Saturday, October 15, a two-day roots music festival featuring performances on Toby’s Plaza in front of Cleveland’s Museum of Contemporary Art (MOCA), a children’s activities tent and family concerts. RootsFest will also include documentary screenings at Cleveland Institute of Art’s Cinematheque: “A Well Spent Life,” a tribute to blues singer and guitarist Mance Lipscomb and “The Blues Accordin’ to Lightnin’ Hopkins,” which chronicles the life of the legendary Texas guitarist and performer. The Cleveland Foundation supported the creation of the Uptown District as part of the Greater University Circle Initiative, a foundation-led collaborative effort between multiple anchor institutions in University Cirlce to rebuild neighborhoods and improve economic opportunities for area residents. Since 2005, the Cleveland Foundation has committed more than $11 million in and around Uptown as part of its placemaking effort in Greater University Circle. Cleveland Foundation: Established in 1914, the Cleveland Foundation is the world’s first community foundation and one of the largest today, with assets of $2.1 billion and 2015 grants of $95 million. Through the generosity of donors, the foundation improves the lives of residents of Cuyahoga, Lake and Geauga Counties by building community endowment, addressing needs through grantmaking, and providing leadership on vital issues. The foundation tackles the community’s priority areas – education and youth development, neighborhoods, health and human services, arts and culture, economic development and purposeful aging – and responds to the community’s needs. Case Western Reserve University: Case Western Reserve is one of the country’s leading private research institutions. Located in Cleveland, we offer a unique combination of forward-thinking educational opportunities in an inspiring cultural setting. Our leading-edge faculty engage in teaching and research in a collaborative, hands-on environment. Our nationally recognized programs include arts and sciences, dental medicine, engineering, law, management, medicine, nursing and social work. About 5,100 undergraduate and 6,200 graduate students comprise our student body. Visit case.edu to see how Case Western Reserve thinks beyond the possible. University Circle, Inc.: University Circle Inc (UCI) is the development, service, and advocacy organization responsible for the growth of University Circle as a premier urban district and world-class center of innovation in health care, education, and arts & culture. See more at: http://www.universitycircle.org. Roots of American Music: Roots of American Music (ROAM) is a nonprofit organization whose mission is to facilitate learning in diverse communities by providing customized arts programs, workshops, residencies and performances through use of traditional American music. Learn more at http://rootsofamericanmusic.org/missionhistory/.